My son and his friends always love to run around making lots of noise when my daughter is napping... so I usually either send them outside or come up with a little challenge for them. This week we worked on strengthening our finger muscles and developing fine motor skills while making leaf patterns with clothespins. I love simple activities that require little to no effort on my part and keep kids engaged and having fun for awhile... this was one of those sort of activities. 1. Tie yarn from one chair to another chair to make a clothesline for each child. 2. 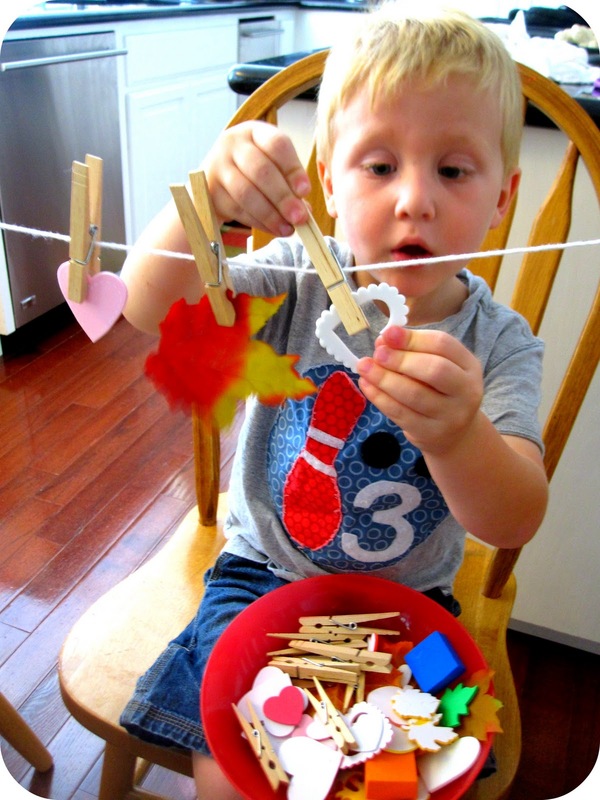 Give them a bowl of objects and clothespins and suggest a challenge... or have them come up with their own. Our challenge was to make a pattern. It was simple, open-ended, and kept the kids focused for awhile. - working on coordination while we pinch and hold the object up to the clothespin at the same time... it is tricky! 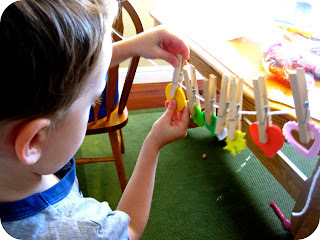 Do you have a favorite patterning activity that is simple and easy? Please share it! We'd love you to link it up to our Best of October Link Up if it is one of your favorite posts from this month. If not, share another favorite recent creation.